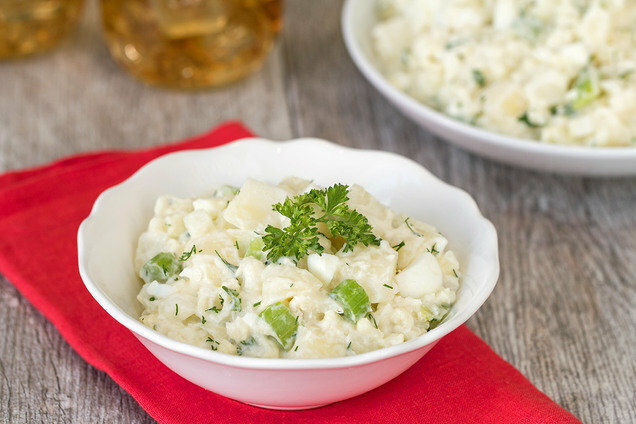 Place cauliflower and chopped potato in a large microwave-safe bowl. Add 1/2 cup water, cover, and microwave for 6 minutes. Stir, re-cover, and microwave for 4 minutes, or until tender. Once cool enough to handle, drain excess water. Transfer 2 cups of the cooked cauliflower only (no potato) to a blender or food processor. Add mayo, yogurt, mustard, seasonings, and 1 tbsp. water. Blend/process until smooth and uniform. Add mixture to the large bowl, and stir to coat. Add all remaining ingredients. Mix well. Refrigerate until chilled, at least 1 hour. Prep/Cook FYI: Times do not include hard-boiling, peeling, and chopping the egg whites. If not done in advance, allow about 5 minutes for prepping and 20 minutes for cooking. Or look for hard-boiled eggs in the fridge section at the store. Hungry for More Summer Side Dishes? Make sure this dish is at every block party for the rest of the summer -- click "Send to a Friend" now!